Available in multiple shapes and sizes, for residential and commercial use! We are among the leading wholesale metal planters manufacturers of India. We designs and manufactures metal planters, pots and flowering boxes using quality materials to give robust and attractive look and feel suitable for decorating residential and commercial places. We are bulk manufacturer of decorative planters based out of handicrafts city of Moradabad, India. We design and develop planters by keeping in mind the need and requirements of homeowners, architects, home staggers and interior designers. Our designers and artisans keep tap of Industry and infuse the market dynamics by combining modern style of planters with robustness and durability. We are one of the wholesale manufacturers of shaped planters. The various shapes of planters we designs and manufacturers are rectangular, square, round, oval which are of multi use means these planters can be used for indoor as well as outdoor placements. Shape of planters plays important role as it is directly reflection of consumption of space. We focus of developing some of great shapes which are high in demand, however, we are always believe in meeting the customer requirements by customizing as per the customer requirements. One thing goes across all the shapes and that is durability and making them exceptionally sturdy. Rectangular shape metal planters are carefully crafted out of top quality metal and designed to give flawless finish. The shape can also be altered slightly to give bit of oval reflection to make it more attractive. These planters are best suited for patios, rooftop, decks and balcony. They can be developed by using Steel, Aluminium, Copper and Brass and the can be made available in different colors. Square shape boxes are carefully crafted out of top quality metal and can modified to more attractive looks. These planters are best suited for patios, decks and balcony. These can be developed by using base metals such as Steel, Aluminium, Copper and Brass and the can be made available in different colors and finishes. Rounded flowering pots can be used for indoor as well as outdoor decoration depending upon the theme of the property. They can be featured of different colors and sizes. Normally, the light metal is used to develop such planters as they can be moved to any place as and when needed. The oval galvanized metal planter is light weight and movable planter box and perfect architectural planter off-center planting. This modern planter comes with handle to move it freely and for hanging purpose. Table top planters are light weight modern pots generally for indoor decoration. These can be designed in multi colors featuring theme of the property and are best suited where there is shortage of spaces. Indoor planters are designed by keeping few yet essential points in mind, such as water tight design, beauty and durability. Since they are kept indoor therefore, there should not be any water leakage and their design should be elegant and aesthetically attractive matching indoor theme of the property. You can always infuse fresh life into your home with the ultra modern indoor planters for plants of all types and seasons. Outdoor planters are designed in a variety of sizes, shapes, and top quality materials to perfectly fit landscaping designs. The metals used for these planters are of heavy gauge and well polished to resist changing weather conditions. Large commercial planters are manufactured with heavy gauge metals. These planters can made available in various colors and sizes depending on the landscaping designs. These planters are excellent decorative items and can be placed at property entryways, lobbies and garden. 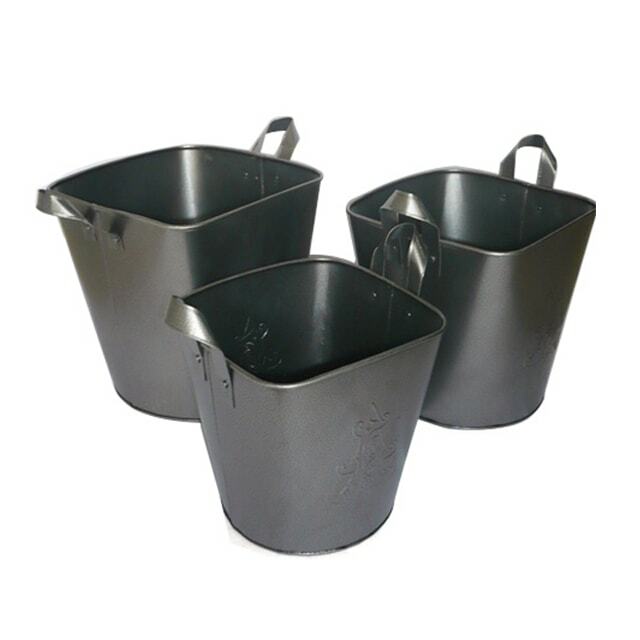 The bucket shaped planters are oval shaped and exactly made to look alike of a bucket. These are made up of galvanized metal and often painted with attractive colors. They are beautiful and durable piece of flexibility and can be placed in rooftop, balcony and patios. We design and manufacture all of our metal planters using four type of base metals. however, there are numerous color shades to choose from. SOME MORE DESIGNS FOR YOU! Affordable and very much stylish!